Are Portland Bolt’s stock coupling nuts tapped from one end or from each end? 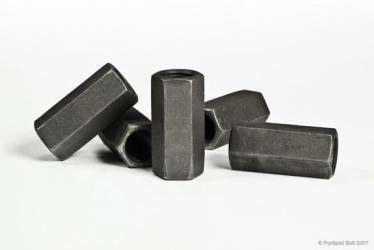 Portland Bolt’s stock ungraded coupling nuts are tapped all the way through from one end, while our high strength and custom manufactured coupling nuts are tapped from both ends. What does this mean for your project? Coupling nuts are typically intended to connect two separate threaded fasteners together, although some applications require the coupling nut to be fully engaged on the fasteners. In the former application, since 1 diameter of thread engagement is enough, most coupling nuts are tapped from each end, with the internal threads meeting in the middle. This allows the rod to be engaged approximately 1.5 diameters, but it does prevent the fastener from threading all the way through the coupling nut. Since the two ends are tapped separately they don’t necessarily make a continuous thread where they meet. This means you typically aren’t able to assemble the coupling nut onto a fastener past the center line of the coupling nut unless, by chance. the internal threads just happen to line up. If you are using our stock, ungraded coupling nuts you are able to assemble them all the way down, since they are tapped from one end only. If you have any questions about coupling nuts or anything else, please give one of our helpful team members a call and we’ll be happy to help.